Hepatitis C Drugs Approved For Treatment Of Kids, Too : Shots - Health News Many insurers have required that adults with hepatitis C be very sick before they can get access to expensive drug treatment. But Medicaid has special rules that may get kids and teens access sooner. 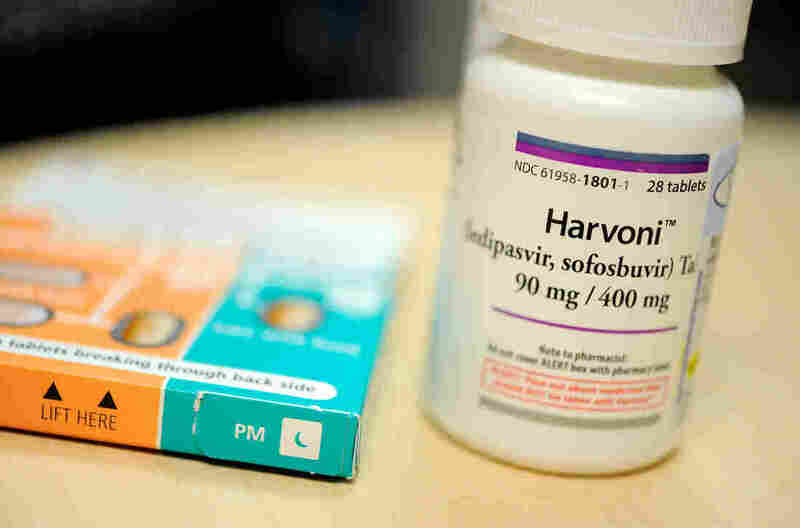 In two recent clinical trials of Harvoni and Sovaldi in the treatment of young people between the ages of 12 and 17, the drugs eliminated all traces of the hepatitis C virus in 97 to 100 percent of patients, generally in 12 weeks. The two drugs approved for pediatric use by the Food and Drug Administration, Harvoni and Sovaldi, have both been highly effective in treating adults with the disease, though Medicaid programs and private insurers often have balked at paying for the pricey drugs for adults. In two clinical trials of Harvoni and Sovaldi in the treatment of children between the ages of 12 and 17, the drugs eliminated all traces of the virus in 97 to 100 percent of patients, generally in 12 weeks. Trials that test the effectiveness of the drugs in younger children are ongoing. "It's great news for our kids," said Dr. Jessica Wen, medical director for the viral hepatitis clinical care program at Children's Hospital of Philadelphia, which had more than a dozen kids in the trials. "Historically every new medication that's approved for adults, there's always a lag for pediatrics," she said, noting that the wait can be as long as a decade. The FDA approved Sovaldi in 2013 and Harvoni in 2014 for adults, and the drugs were widely hailed because they cured nearly everyone with minimal side effects, typically in 12 weeks. Earlier treatment regimens that required interferon injections and antiviral pills for six months or more were less effective and frequently caused severe side effects. But the new drugs weren't approved for kids, and many doctors have been delaying treatment in anticipation of pediatric approval by the FDA. Because the FDA approval applies to children over age 12 who weigh at least 77 pounds, this group would require an adult dose. Since neither adults nor children are routinely screened for hepatitis C and many don't develop any symptoms after becoming infected, people may have the disease for years before learning that they're sick. Children often come to clinicians' attention when their regular pediatrician learns the mother is infected, said Dr. Karen Murray, a professor of pediatrics at University of Washington medical school who works at Seattle Children's Hospital, which had several children in the trials. Children who contract hepatitis C may suffer less liver damage over time than those who contract the virus as adults, Murray said. Still, "there are all these social and biological events that may happen like marriage and childbirth, and it would be nice if they were cleared of the virus before then," she said. Increased competition from other drugs since then has helped reduce the price somewhat, and insurers aren't creating quite as many obstacles to treatment now, said Ryan Clary, executive director of the National Viral Hepatitis Roundtable, a patient advocacy group. However, "coverage is still a very significant problem," Clary said. Insurance coverage may be less problematic for children. Under federal law, state Medicaid programs must cover "early and periodic screening, diagnostic, and treatment services" for children under age 21 that are necessary to correct or ameliorate physical and mental illnesses. "The short answer is that [Medicaid] will likely require coverage for all kids, regardless of whatever the coverage policies for adults may be," said Matt Salo, executive director of the National Association of Medicaid Directors. State Medicaid programs have leeway with adults to decide that a treatment isn't medically necessary unless the person's liver is damaged, explained Kelly Whitener, an associate professor at Georgetown's Center for Children and Families. "But for kids, the federal standard ... is broader, so medical necessity could not be linked to severity of illness/liver disease," she said. It's unclear what private insurers will do regarding coverage of Harvoni and Sovaldi for kids. "Given these are recently approved drugs, we expect plans will follow their normal practices," said Kristine Grow, a spokesperson for America's Health Insurance Plans, a trade group. "This includes evaluating the evidence, systematic review of the medication's effectiveness, considering any federal or state mandates, and updating their policies as new evidence is available." Kaiser Health News is an editorially independent news service that is part of the nonpartisan Henry J. Kaiser Family Foundation. You'll find Michelle Andrews on Twitter @mandrews110.